“Other days of the year you can maybe make it a few hours without thinking about your loss; other days of the year you can pretend that you are an ordinary person and that life is normal. But not on Mother’s Day. The simplicity of how she describes such an intense and complex reality is what makes it so profound to me. Its true, other days of the year we can take time for our selves, go for drinks with friends, go to the gym, go shopping. We can find ways to be distracted for some time, albeit short, and pretend that we are normal. But on mothers day ( and fathers day) we are parents with out our child, and not just for that day, for every day of every year. For the rest of our lives. And this day designed for children to appreciate their mothers, or spouses to appreciate for them is a reminder of the hole your child left, a hole that will never fill. On my first mothers day, I felt like I had become part of this extremely exclusive and also accepting and inclusive society. This club of woman who just know each other. Where no conversation is out of bounds, where there is talk of poop, privates, and partners. A group that “likes” each others photos of their kids, and supports one another by swapping, diets, clothes, baby clothes, recipes and discipline regimes. A society of women who support women. I remember after I had Lilee, every time I would see a picture of a new born, I would get genuinely excited for who ever that baby belonged to. It could be someone I use to know in high school, or someone that I didn’t know at all and was unsure of how they even got on my facebook. But I would like their picture and sometimes even go as far as to comment “congrats! !” And my heart would be full for them as I squeezed my sweet little girl. It was this unspoken camaraderie that bound us all together. Now, I have the heart of a mother, without the responsibilities of one. I have the instincts of a parent without a child to nurture. I am a mother, but I have no baby. So now, seeing these pictures, videos, mother’s day commercials and posts, my genuine happiness for these other extremely important woman, is short lived, and pushed aside by grief. Its being a teacher without having anyone to teach, a musician without instruments, and a painter without paint. I had the honour of having 3 mother’s days with Lil. One was before she was diagnosed, and as a gift from her dad, I had my love for her marked on my body in ink. The second one we were in isolation at Children’s Hospital because she had contracted C-Diff (an infectious and constant diarrhea caused by a bacteria in the body and a lowered immune systems inability to fight it off… its extremely painful for the patient and devastating to watch for a parent). I spent the day with my girl, loving her, watching Happy Feet and changing her diaper a million times. My mom and step dad came from Abbotsford, brought me a gift (an incredibly adorable tea pot) and when Lilee took an early evening nap (c-diff makes you feel awful, and it took a lot out of my poor little bean) they grabbed take out, some sparkling juice and we went out onto the rooftop play area and had a wonderful, sunny Mother’s Day dinner. 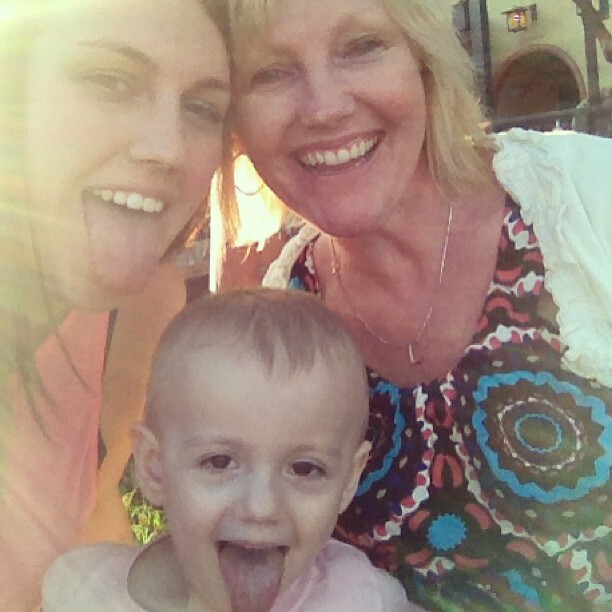 The third, and last, Mother’s day I shared with my girl was last year. We went out for a mothers day brunch with my whole family and an overwhelming amount of other families. We knew at this point that the trial chemo hadn’t done much, and we knew that it was a very high possibility that this would be my last mother’s day with her. I couldn’t shake it. As she bobbed around, going from aunt, to grandma, to great aunt, to great grandma I felt like my whole world was crashing in. I watched the people around me, the people in front of me. I watched as everyone laughed and smiled and enjoyed the moments they were having and I felt like I couldn’t breathe. I just wanted to take Lilee and run, just escape somewhere her and I could be alone, and the rest of her days would be spent solely with me. No distractions, no other people. Just me and her. Just us. I fought back tears the entire brunch, and couldn’t be more relieved when I was sitting next to Lil in her car seat, in the back of the car on the way home. Trying to stay calm, my sister and I wanted to do something nice for my mom too, so we left Lil (although it threw me into a bit of an internal anxiety attack) and went to get the ingredients for mom’s favourite dinner. Because of my sister, because of my mom and step dad, and because I was finally able to just enjoy my daughter in the comfort of my parents house, mother’s day didn’t end as traumatically as it had started. But it was an extremely difficult day, knowing it would be the last one I would spend with her. I would never get a hand made card, or some art made at school. I would never get surprised with flowers from her, or even just a phone call if she was far away. I would never get to experience another mother’s day with my girl, the day where, whether she likes it or not, she would be all mine. I miss my girl more than I can say. She made me a mother. She made me the person I am today. She is my entire heart and not a day goes by that I don’t imagine holding her, tickling her, playing and dancing with her. And there is nothing I wouldn’t give to cuddle up with her on the couch and watch Wreck It Ralph or Pitch Perfect for the 1 millionth time, eating chocolate kisses. But On Sunday I’m dropping off the grid and I’m appreciating and celebrating MY mom. Through all of this, the pain, the heart ache, the anger, the disappointments. Through the triumphs, the successes, the blissful and the best moments, she was always there. She was there watching HER daughter deal with all that was dealt, and her granddaughter live through the unimaginable. As my heart sang, hers did too and when my heart broke, not only did hers break for her own pain, but for mine as well. I watched my daughter go through hell, and inevitably die, and my mom watched me do the same because a piece of me left with Lil that day. As each day goes on, my mom finds ways to build me up, to carry me and to help me find a way to live. She does all of this with a broken heart, missing her grand baby. I will be forever indebted to you, Mom, and I will never be able to say thank you with the emphasis that is in my heart. Completely Screwed Up, and I Don’t Care Who Knows It. Once a mom, always a mom, Chelsey. Nothing will change that. I cannot fathom what you are going through but to me I would never take away your title of Mommy. Especially since you are the strongest one I know and will probably ever know.